Isn't this little elephant way too cute. He is from Our Craft Lounge. They also have a dog set I got and the Beaver card I posted last week was theirs too. I just love these stamps they are way too cute. Hope everyone had a great weekend. I am lucky I get this Tuesday night off for my day after Thanksgiving Holiday which fell on my day off so I got to make the day up somewhere. Its hard to believe only 24 more days till Christmas. I love Christmas its my favorite holiday. I love giving my family gifts that each one I pick out with them in mind. Hope everyone had a great Thanksgiving. We didn't do much but I actually made a Turkey breast which normally I don't even do that. Then Friday I went to see Twilight again by myself as my husband didn't want to see it a 2nd time LOL. I also went to JCP which had some great sales if you don't mind the crowds. I also got from Robins Nest the Cosmopolitan Alphabet from Quickutz for only $29.99 I think it was. Oh can't forget I did buy House Seasons 1, 2 & 3 from Amazon. That was the extent of my Black Friday shopping. 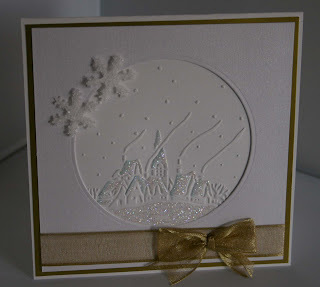 This card was made using my Cuttlebug embossing folder and Spellbinders dies. One I added snowflakes and other I added the Penny Black Puppy. Here are some doggies that are from PC Crafters. I think they are so adorable. I had joined that group so many years ago but didn't realize that their images also had black and white images included with 90% of them. If I would have only known I would have tons of new things to use. HAHA... Anyways this is one of them which I made parts 3d and added glitter and lacquer. All other paper I buy my colored from Stamping up which is great for laying I do not use it for cardbases as it's only 80# and I prefer thicker. I do however us Neenah which is 80# but its thicker for some reason which I buy from Anchor Paper Which I buy Cover and Classic Linen one of the Whites. I get misc paper at Archivers when I go there. Isn't this stamp too cute. Its by Pink Poison. I pieced the couch with the same paper as the background. 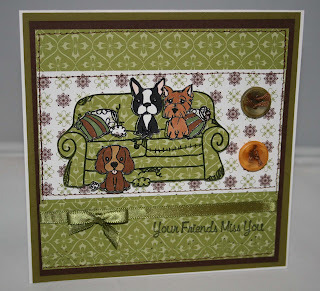 I just love any little doggy stamps they are too cute. Now for the question of the day. What are your view points on stamping the back of cards with your signature? I use to always do this on all my ebay auctions and quit doing it because someone told me not to. Then I just kinda didn't think about it anymore so I recently pulled out my stamp that I got from Elzybells and started stamping them again. Which I have it listed in my auctions that I stamp the back of my cards. I've gotten a few emails already on people asking if I would continue to do this or that asked if I could not do theirs. Which of course that would mean I don't do any of them again.... Viewpoints on why this would be appreciated. Since I am not understanding why it would make people not by cards. Thats like not buying cards at Target because they say Hallmark at the back of them. 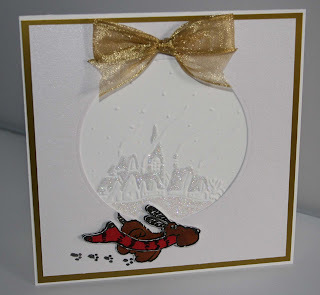 Here is one of the new Whiff of Joy snowman by Elisabeth Bell I got. Isn't it too cute. Colored with markers on kraft paper and used shimmerz for the snowman. 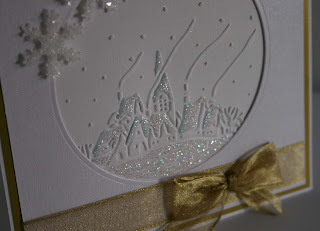 The snowflakes are spellbinder dies and I used Diamond Dust on them. I think it turned out very cute. Thought I would post a picture of my little baby though she isn't as little as she once was. 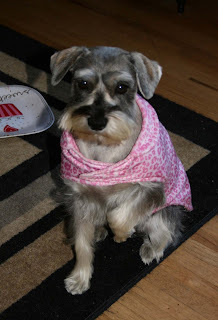 Bailey is a mini schnauzer isn't she adorable and when I say baby she really is a big baby. She sleeps with me when I sleep whether it's night time or day hours after work. She always has to be by me and follows me everywhere. She even sleeps by my feet when I am making cards. She is almost 5 years old I think. I lose track but she is a real sweety. 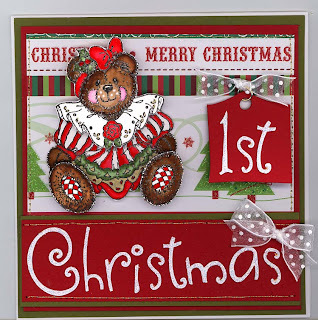 Next is Milly isn't she adorable her designer is Janet from Pink Gem Designs which if you haven't been to her website she has some cute stamps on there. She also Designs for Spiral Whispers. I just love her stamp designs they are so cute how can you not love them. This Milly is done in Pinks which I love at Christmastime. 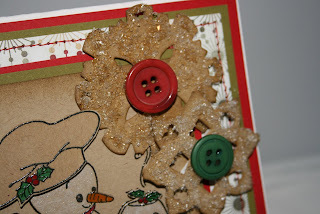 Added Diamond Dust to her snowflakes and paper is DCWV. She is colored in copics. Sorry I have been a bad blogger this week. Seems like I have been on the go nonstop. I went and seen the movie this morning "Twilight" If you haven't read the books they are by Stephanie Meyers and I finished all 4 of them they are excellent. Movie was great and I hope the rest are made into movies also. The characters that play the parts of the book play them excellent and it's like they were made for that part. 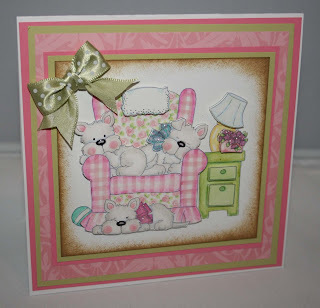 This card is from Our Craft Lounge Isn't it just too cute. I bought 3 out of the sets they had for their opening release. I finished another one too partway so will finish it up on my next days off. I ain't too ambitious in my scraproom on days I work. This one is watercolored on Fabriano Coldpress paper. 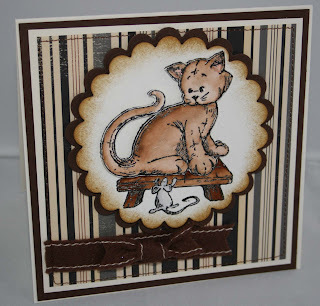 Here is another stamp from Sugar Nellies, I think it is so cute. Colored in copics and background is embossed and distressed. I sewed along the edges and added some dew drops. 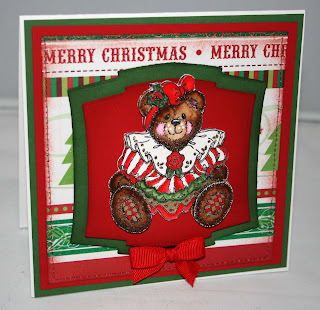 Here is another card I did with the little Christmas bear that I did in the 1st Christmas card. Someone wanted to know who makes the stamps as you know I like giving plugs for different company's but unfortunately I unmount all my stamps so unless it was something I bought recent or I ones where I started dividing them by company. I have no way of knowing, this is one I have no clue who makes it. I think I bought it a stamp conventions when I started stamping about 8 years ago. Anyways this one is watercolored and parts are 3d of course. I just love this little bear. 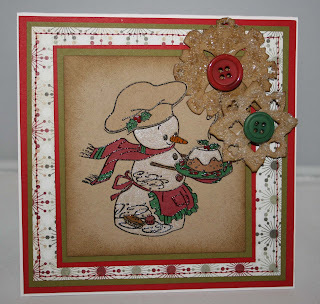 These are Digi stamps from CC Designs - All that scraps. They are so cute. This release you had the option of buying this set along with her normal sets. I bought the normal sets and while I am waiting on those to arrive I bought these to try out. They come in zip format and you print them out however big or small you want. See the smallest one's vs the largest one. I printed them on my Papertrey Ink cardstock and then just colored like I normally would. I thought they were so cute. These beautiful Angels come from Whiff of Joy and were designed by Elisabeth Bell. I love this ladies designs and she amazes me with her talent. I am making a couple sets of these for my Mother in Law and for my Sister because they both love angels. These are both embossed which I do for 99% of my cards. I colored them in copics and made parts of them 3d. The sentiment is also Whiff of joy and the pile of books is a seperate stamp also. I can't wait to get my new Whiff of Joy stamps. And can't wait to see what Elisabeth comes up with in the future... So this is it for tonight. I will have some more cards for you tomorrow. I have another post after this one I am going to be posting with actual cards tonight. 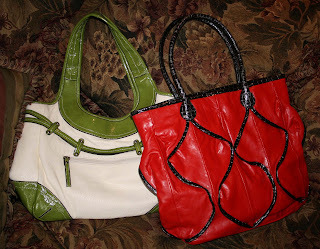 But I had to show you my new purses I got today. Me and my daughter went to a place today called Lillians Its only open one weekend a month. Prices are so great there. How much do you think these purses cost me? They are both leather. Wow, The world of Blogging is still amazing to me. I know I have received more of these awards in my comments but was never quite sure what to do with them LOL. 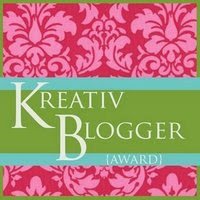 I went and read Cheryl's Blog after I seen her comment that she left me an award in hopes to figure it all out. Be sure and check out her blog it's great. There and she is very creative and adorable. And I can honestly say before this reward I have never visited her blog. I will definitely add her to my google blogger so I can see what she creates in the future. It looks like Cheryl makes tons of cards too. I just love what she did with Bella's stamps. I have so many of her stamps but I can never think of creative things to do with them. So they sit in my album unused. 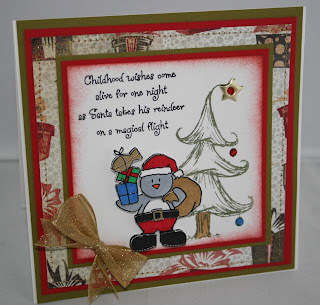 I may have to pull some out again after seen Charyl's adorable cards with them. There are so many hundreds of blogs out there. I have Google Blog reader which lets me know as blogs I like are updated. I absolutely love this tool and as I find great new blogs like Cheryl's and it gets added to my blog reader and I get notified every time she posts. If you don't have one please check it out. Suzanne, I love her blog and visit it every time it's updated. 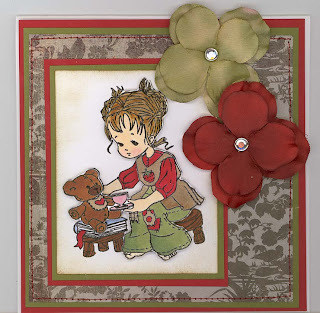 She is the one who first turned me on to the beautiful background stamps to add with the cute little Tilda stamps. Thanks to Suzanne my pocket book has suffered. Her cards are absolutely adorable though so be sure to check her out. 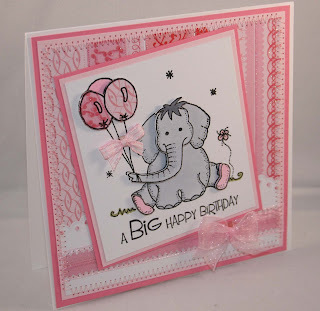 And after seeing her blog today another background stamp I need in the future..
Kim, If you haven't been to Kim's blog yet its absolutely amazing her cards. Every time I see her cards I am in awe by her creativity. She also is on the design team for CD stamps which I so enjoy seeing her samples every month. Kim has her own style that is for sure. When I see a card of hers without looking I can always tell who's it is. Please be sure to visit her blog. 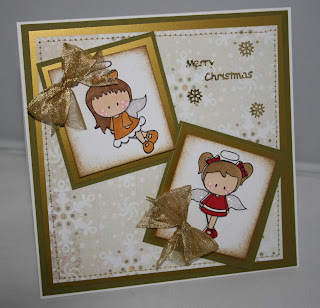 Becca, I just love Becca's blog she is very creative and I love her style of her cards. She puts a lot of work into each card and again I am in awe by everyone of them. I love looking at all her unique layouts of her cards. I tend to stay with the same one or two and not venture out into all the different ones are out there. Be sure to go see all her beautiful cards. Claudia, Her blog has been inspiring me for a very long time. 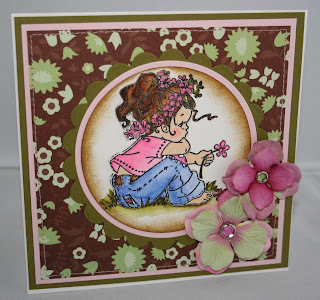 I believe it's one of the first places I first seen Magnolia stamps and you all know how I love those little gals. So thanks to Claudia I have bought tons and tons. She has a very unique style about her cards too... 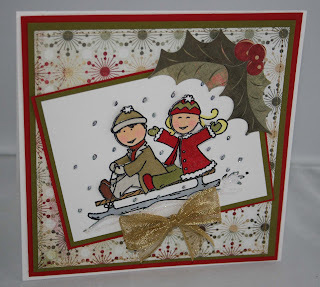 Please be sure to visit her blog and see all her adorable cards. 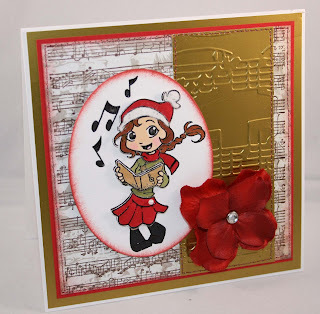 Ana, She has another great blog and her cards are cute and whimsical and very unique. She also makes some great non card items. I so enjoy her blogs and drool at her items which are non card related. I have yet to venture out in that directions. So far I only create cards. 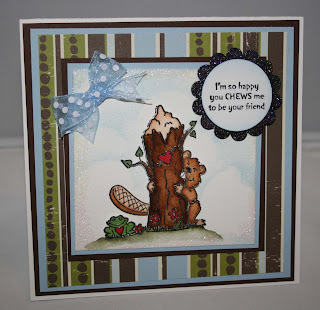 Please be sure to check out her adorable cards and projects. You will definitely be inspired. 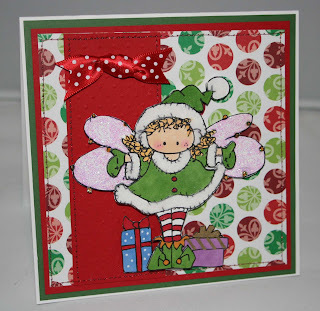 You know how I am always bragging about Janet and her great designs she does for Spiral Whisper stamps. Well she decided to venture out and make stamps on her own also. She will still be doing them for Spiral Whispers also but she now has Pink Gem Designs. Please stop by and check out how cute her new little gals are. I can't wait to order some after I am done with my Christmas shopping. I hope she does animals for her own store too they are just adorable. 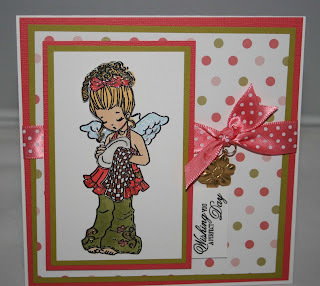 Here is one of my Elzybells stamp I just love these little kids. This one is done in copics and added glitter for the snow and some new Basic Grey paper. Isn't time going by fast just thing another couple weeks is Thanksgiving. At least I get a couple days off which I am so looking forward too. I have some things I want to make for family members for Christmas also. I figured I will be making cards up until probably first week of December and then get my own cards done and my gifts done. Hope everyone is having a great week.. Isn't she too cute. She is from Sugar Nellies also as you can tell I just got some new stamps from there not too long ago. I watercolored her and then made parts of her 3d. Distressed the edges and used some felt ribbon I got from Stampin Up..
Hope everyone has a great Week.. Here is a card I made with one of Elzybell's penguins which I love. The tree in the background and sentiment are also hers. The background paper is Basic Greys new paper. I love it also. 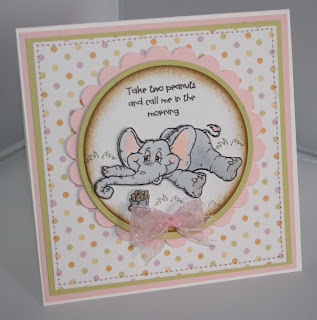 Whiff of Joy had a new release today for some of Elisabeth Bell's stamps. I ended up ordering 5 as I am trying to cut back because of Christmas. That reminds me I have to find my Christmas Widget so we all get reminded how close Christmas is.... Have a great weekend. Here is a card I made for someone that requested a Baby Girls First Christmas. I thought it turned out cute. 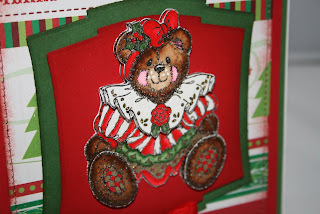 I watercolored the bear and used my cuttlebug for the letters and tag. Used some beautiful gold metallic ink for sewing around the edges. 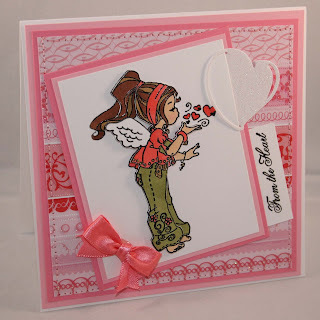 Here is another one of my new stamps from Sugar Nellies.. Isn't she too cute. All colored in Copics. Hope everyone is having a great week. 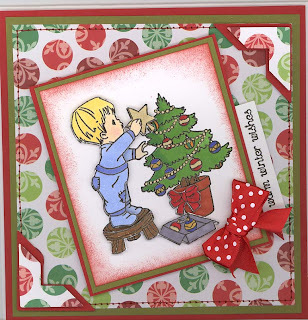 Just thought I would share with you a card I made today with a new Sugar Nellie's stamp I got "Trimming the Tree". Isn't he just too cute. I just love him. He is colored in Copics. 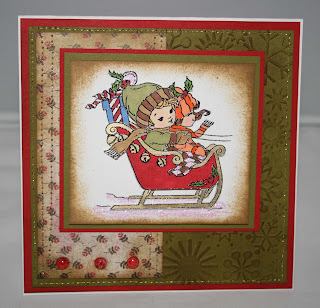 And isn't the paper great its from the new DCWV Christmas stack from Joann's. 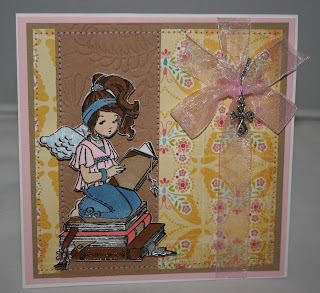 I will share another new Sugar Nellie's stamp tomorrow with you... Have a great week. Isn't this little gal too dang cute. I colored her in Copics. She is from Whiff of joy along with the saying. Elisabeth Bell is her designer. I am going to be making a whole set of these for my Mother in Law for Christmas because she loves Angels. Here is another card I made on my day off. Isn't she just too cute. She is colored in markers and the background paper is from DCWV Sweet Stack. Added ribbon and sewed along the edges. I go back to work tonight. My weekends which are your weekdays go by way too fast. I didn't get as many cards made as I wanted to with Halloween and other things that were going on.